Canada is justly proud of her role as a world leader in nickel production. The value of nickel as a coinage metal has been recognized for many years; not only is it attractive but it is also tough enough to withstand the wear and tear of commercial use for long periods.The use of nickel for Canadian coins dates back to 1922, when the first large five-cent piece was introduced. Prior to that time, coins of this denomination were much smaller silver pieces - known as 'fish scales' in the Maritimes. 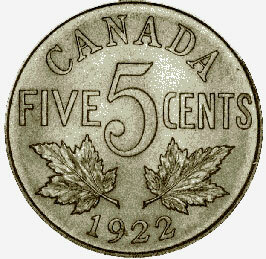 The design for the reverse of Canada's first nickel five-cent pieces is very simple, composed only of two maple leaves, the word CANADA, the value, and the date. It is similar to the design introduced two years earlier for the reverse of the small cent. It is interesting to note that thc U.S. five-cent piece, commonly called a 'nickel,' has never contained more than 25 per cent nickel. This coin is part of the Bank of Canada's National Currency Collection.